Thoughts for Thursday: Are there Nazis in Valhalla? I saw this meme a few Thursdays ago shared on FB in one of the larger Pagan groups (of which I am a member). At the time, I assumed that it had been shared in that group simply because it features Thor…and it was Thursday. So I didn’t think much about it beyond that, because let me tell you, it can be difficult to find a variety of good artwork featuring Thor. However, within these last two weeks, I have seen this meme shared within various Heathen and Pagan groups over a dozen times. 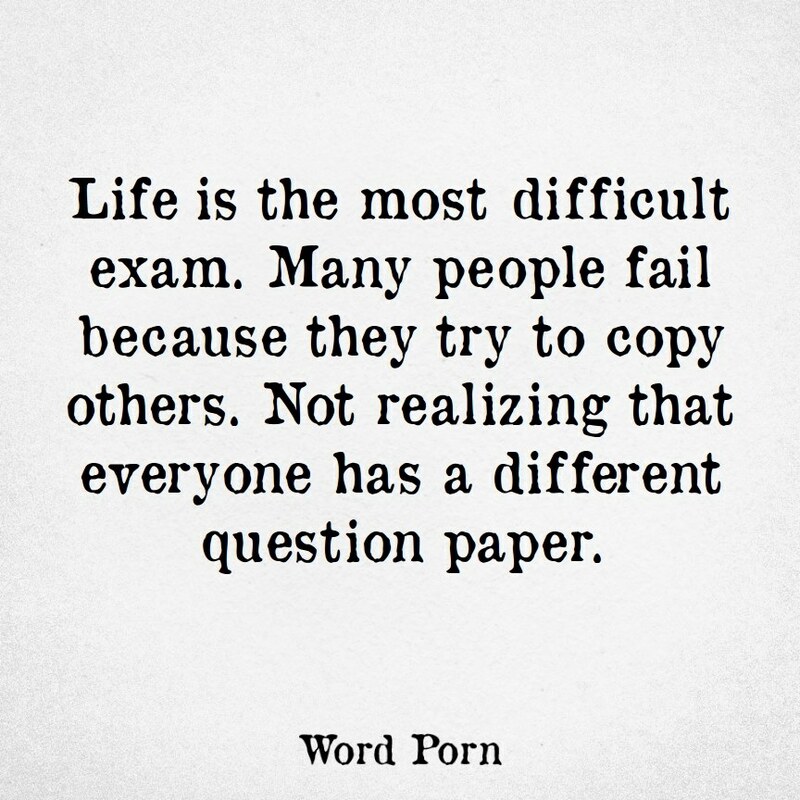 In that, I will admit that I have been constantly reminded of it simply because it has been cluttering up my FB feeds. But again, I’ll admit that I didn’t think too deeply upon it. Because, like most memes, I noticed that while it garnered a lot of likes and shares, there was little to no commentary on the premise of whether or not the meme was based on some sort of ‘fact’. And so here it is again, on another Thursday, and I awoke to see that the first post on my feed concerned this meme. 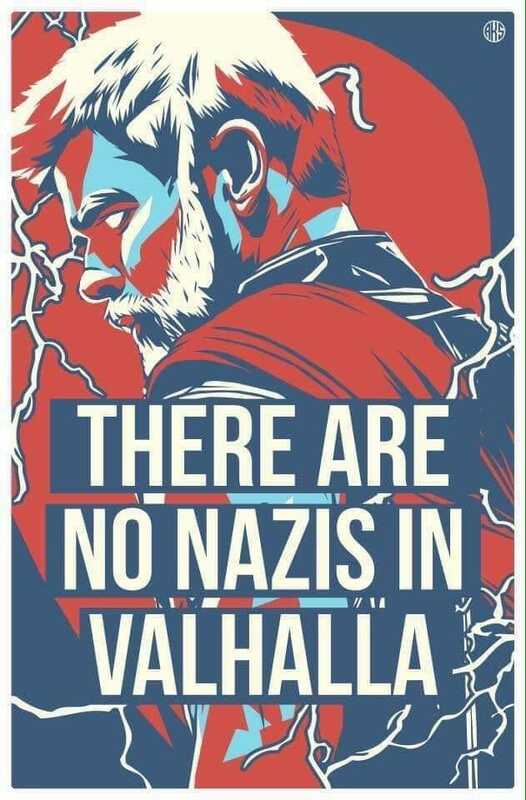 Yep, after a week, someone in one of my groups decided to do a dump post meant to call out zir opinion on several ‘popular Viking memes’ – including this ‘No Nazis in Valhalla’ meme. Evidently this particular meme was the one that set zir over the edge. So, this meme generated a rather intense discussion upon whether or not there would be Nazis in Valhalla, which touched briefly upon the essence of Valhalla as a training ground for Ragnarok, the role of Valkyries, and what’s most interesting to me, a debate/speculation upon the spiritual beliefs of Hitler. So…spurred on by that discussion – and based upon the two main premises that Valhalla is a training ground for Ragnarok, and that the Valkyries choose the ‘best’ and most capable warriors – my thoughts wandered in the direction of whether or not the morality/political stance of a warrior ** was part of the equation. Now, based upon what I’ve gleaned from pursuing a liberal arts education (majoring in English history and minoring in linguistics), as well as the many books, articles, and all the academic discourse I’ve heard and read over the last ten years regarding Norse society, my first response was that there would be no Nazis in Valhalla. And in response to my understanding of what I’d gleaned from that liberal arts education, I felt safe in making that surface conclusion that the Norse may have looked upon the beliefs and actions of the Nazis as violent and unjust. But then, it occurred to me: as history notes, the Nazis saw their nationalistic goal to overtake Europe as just and righteous, as they felt it was their destiny/birthright as a nation and a race. And so it is that the Nazis perceived themselves as just, as righteous, as doing ‘right’ and that single-minded determination to achieve their destiny/goals by any means necessary led to genocide and a world war being waged in response to their attempts. Though the consensus of the discussion concerned the purpose of Valhalla being a place where the most skilled and competent warriors are to be gathered and trained for Ragnarok, no one speculated upon Odin or His agenda at all, so I do not know why this thought occurred to me at all. Glad of War, glad of war, glad of war…. And yet, I could not shake it. Are warriors chosen for Valhalla based upon their skill *and* their morality? Are they chosen based solely upon their skills and abilities? And if warriors were to be chosen solely upon their skills and abilities, perhaps only then there could be Nazis in Valhalla. Sometimes I write letters that I never mean to send. Letters to the Universe full of all my most private thoughts and ideas as a means of working things out in my head. Sometimes if my words are especially negative or melodramatic, I burn them, as a sort of ritual of release. This morning I burned a two-page double-sided letter to the Universe, detailing my latest feelings and thoughts of self-loathing, sadness and anger. If that’s not a fitting observation from the Universe, I don’t know what is. Perhaps I am caught, indeed. So, after several days of writers’ block… I suddenly have the urge to post. So I was reading anxious waves’ blog, and I must admit, I was positively gorging myself on her blog also while enjoying my dinner. Feeding my mind while feeding the body. And let me tell you, I was getting positively drunk on her words ! Have you ever read something so well written that it suddenly gives you the urge to write yourself? That’s how you get drunk on words, my friends, and that’s what was happening to me right then. But the difference being that anxious waves deftly plies her craft: her posts are tight, succinct and remarkably well-written. She appears a delightfully sober writer whose words flow and shift within the structure of her paragraphs in a controlled and purposeful fashion. Her graceful prose walks purposefully and confidently down the sidewalk. Meanwhile I am drunk with language, playing fast and loose with the words, and the structure of these sentences is likely meandering haphazardly all over this post, much like a drunk person stumbling down the street. Well, comparison is the thief of joy and thus, when I consider my efforts, I begin to notice that I could have written this much better than I have done…but I am grateful anyway. Her blog has inspired me, and perhaps given me that much-needed nudge towards doing some actual writing rather than sitting on my hands and yearning for perfection. and in that, I find only good things. I see that you are struggling, and perhaps you might assume that I have never struggled…and yet I have. Everyone gets caught up in looking through the wrong end of their telescope at times. 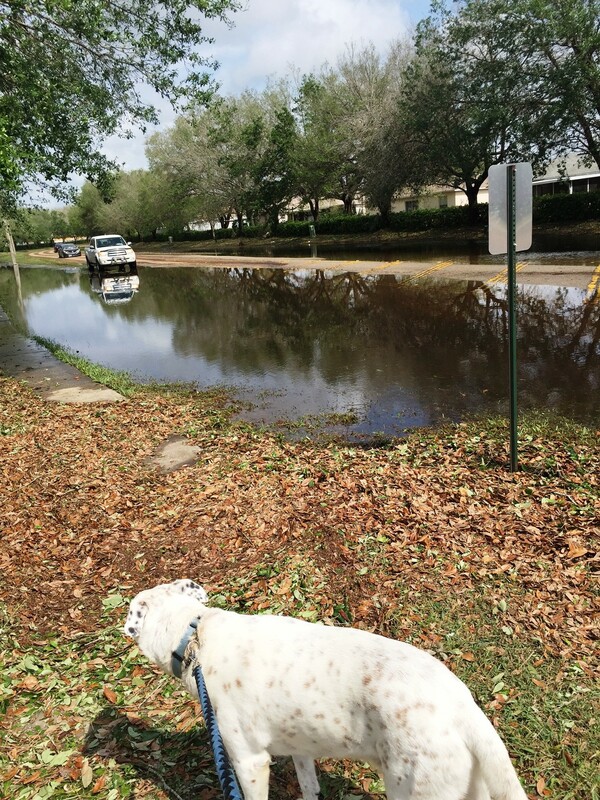 This past Saturday, the area where I live experienced some pretty crazy weather. The combination of these three weather phenomena caused a lot of damage in my neighborhood and the surrounding area. The only reason that the tree didn’t hit the back of the neighbor’s house is that the lower branches snagged on one of the broken fence posts. The wind also tore shingles off the roof, cracked the rain- gutters, tore off several of the gutter pipes, and two more fence panels further down the fence-line. 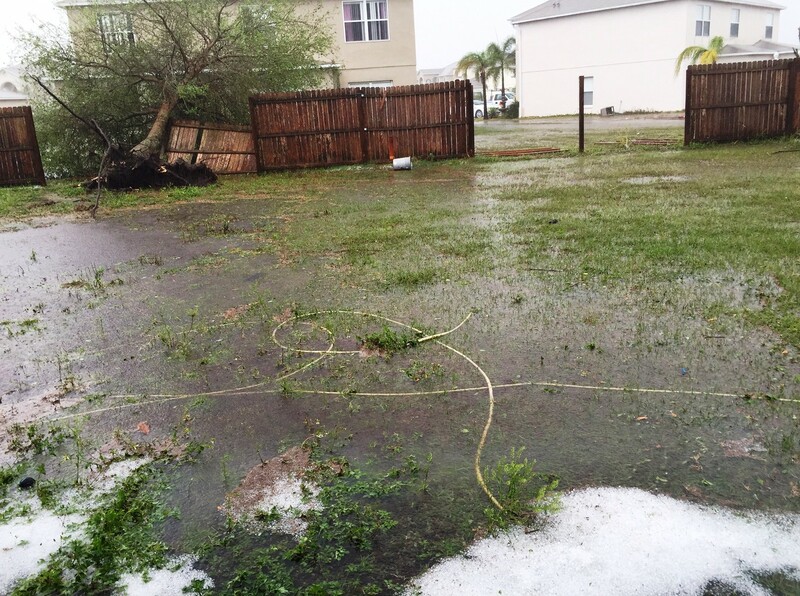 As you can see, the rain flooded the backyard and that white stuff in the foreground is… the accumulation of hailstones. 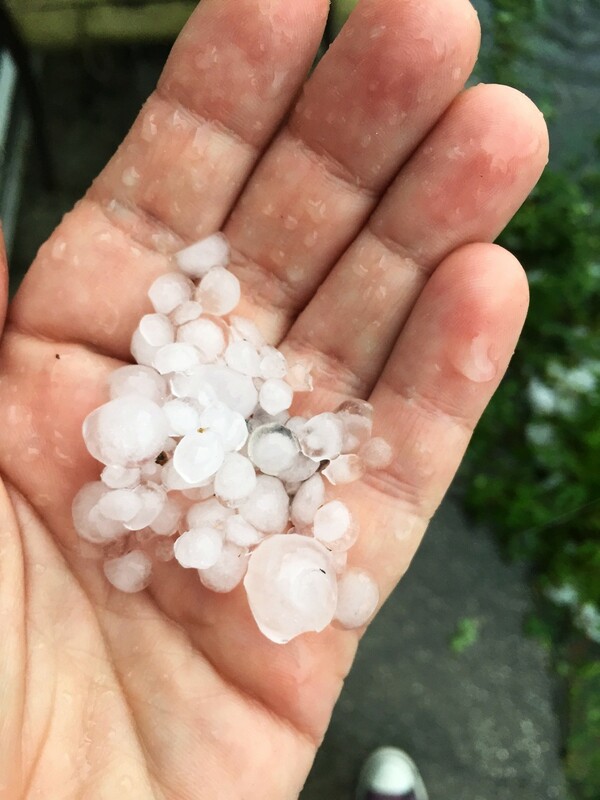 Hail pelted the storm windows for about 40 minutes, tore holes in many of the window screens, cracked the glazing, and scratched and/or pockmarked the glass of several windows. This ‘wind event’ also blew off most of the foliage on our hedges, and destroyed a good portion of the smaller plants in our front garden. The adjuster from the insurance company and a roof inspector came today to discuss the replacement of the roof of both our house and our patio, as well as the repair of the fence. My biggest concern was the water damage to the interior ceilings, as there is now a single crack in the plaster of the ceiling in the kitchen that now requires a bucket to catch the thin but steady leak of water when it rains. 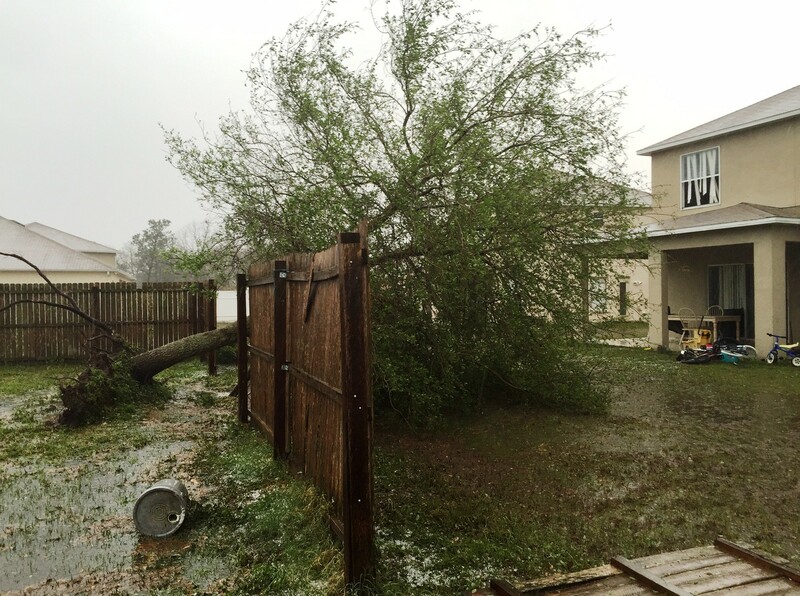 Things could have been so much worse, and we are grateful that only the roof and the fence were the only damages. Thankfully, insurance has offered to cover most, if not all, of the required repairs. Anything that was damaged is certainly replaceable. We were shaken, but we are OK.